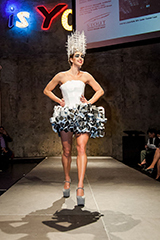 A design process that began last summer recently turned into an award for a group of University of Wisconsin–Stout students at the Fusion + Fashion show at the Aria in Minneapolis. The award for best makeup and hair was received by Apparel Design and Development sophomore Nicole Kluck, Interior Design seniors Mary Brandt and Samantha Swanson and recent Interior Design graduate Autumn Ash. The four of them began the design process in the summer of 2013 by taking photos of architecture in Minneapolis. Once school started, they began the ideation process through sketches and material investigations. Once their final design was set to go, they began building the garment. The four of them faced challenges along the way. “The biggest challenge we faced while working on this project was learning to incorporate everyone’s ideas into one design,” said Brandt. This collaboration was unique in that it involved both interior designers and an apparel designer. “We decided to enter the design in the event to become more involved in the International Interior Design Association organization of professional interior designers in the area, and, in Nicole’s case, to gain experience designing garments,” said Brandt.